The species Fuchsia magellanica Lam. is a borderline frost-hardy erect shrub with scalloped to toothed leaves, to 6cm long, and small flowers with red tubes, deep red, occasionally white or pale pink, wide-spreading sepals, and purple corollas, produced profusely throughout the summer. The variety conica, very similar to globosa [see T.478], has scarlet and purple flowers and globe-shaped buds. To 3m by 3m. Fuchsia magellanica has been used extensively to produce the modern, hardy fuchsias and makes a useful hedge in low frost areas. [RHSE, Hortus, Hilliers', Don]. ‘A very strong growing plant, and flowers freely; the flowers are short and bulky, of a lighter red than either virgata or gracilis.’ [FC p176, 1834]. 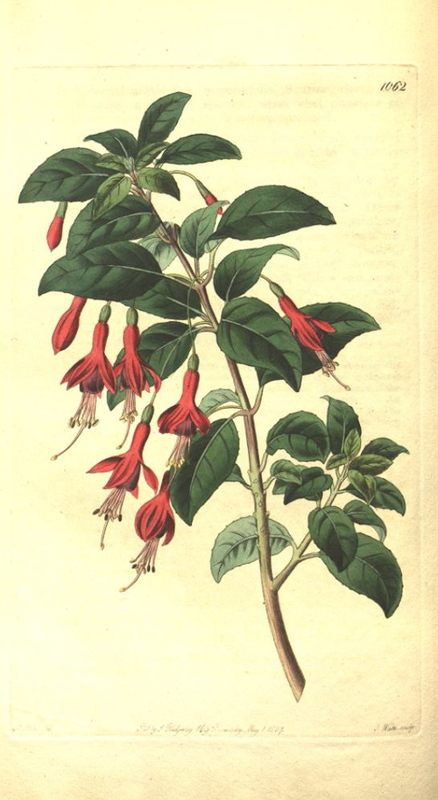 ‘Feuillee found [Fuchsia macrostema] in the beginning of the last century, in Chili […] and says that it is used by the Indians in medicine, and also for dying a black colour.’ [LBC no.1062/1825]. Probably introduced to Europe, at Kew, c.1788. [Don]. However, it seems likely that Don is referring to another variety of Fuchsia magellanica. ‘Native of Chile, whence seeds were sent to Mr. Place, by whom they were presented to the Horticultural Society, in 1824. Our drawing was made in the Chiswick garden, in September 1826. This fine species must not be confounded with any of the varieties of Fuchsia gracilis, from all which it differs in having broader leaves, a less disposition to produce flowers, and in the figure of the tube of the calyx, which has a conical form, being much broader at the base than the apex, in consequence of which it appears divided from the ovarium by a strong contraction. This is not shewn with sufficient distinctness in our figure. As hardy as the other species of Chilian Fuchsias, like which it is also propagated without difficulty by cuttings. A shrub growing two or three feet high, closely covered with leaves, but not producing flowers in much abundance.’ [BR f.1062/1827]. Listed in all published catalogues [T.465/1843]. Received per ‘Sovereign’ February 1831. [MP A2948].